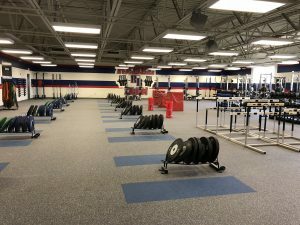 Monte Sparkman enters his sixth year coaching at Richland High School. 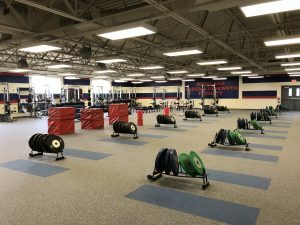 Prior to his arrival at Richland, Sparkman had coaching stops at Burkburnett, The Virginia Military Institute, and most recently at North Ridge Middle School. Coach Sparkman currently serves at the Texas NHSSCA state director. Sparkman was a 3 year letter winner in football and earned his undergraduate degree from Baker University in 2002. He received his master’s degree in education in 2007 from Wayland Baptist University. 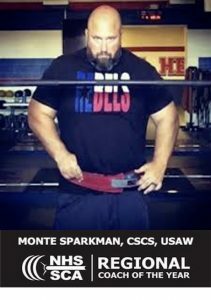 Sparkman is a NSCA Certified Strength and Conditioning Specialist, certified Club Coach and Sports Performance Coach through USA Weightlifting, and a certified Level 2 coach through USA Track and Field. Sparkman is married to the former Sabrina Kingston of Burleson, TX and they have two children: Jacqueline Shea (9) and Alexandra Rea (6).